Spain’s conservatives shifted to the right on Saturday (21 July), electing a traditionalist as leader as they seek to re-establish a clear political identity less than two months after being removed from government. Pablo Casado won a clear victory in the ballot of People’s Party (PP) members, and launched his mandate with a call for party unity, a stronger Spain at the heart of Europe and tougher laws to stave off any moves towards independence by its regions. He won 1,701 votes in a ballot of lawmakers and other senior PP members, easily seeing off the challenge of Soraya Saenz de Santamaria, who received 1,250. She served as deputy to former Prime Minister Mariano Rajoy’s during his six-plus years in office. Rajoy was ousted in a no-confidence vote in June, his authority undermined by a corruption scandal involving PP officials and a perceived failure to quell an illegal independence drive in the northeastern region of Catalonia. He also said he wanted to strengthen the penal code to avoid any further secessionist moves within the country. A lawmaker from the northern Spanish city of Palencia, Casado joined the PP in 2003. He has called for a return to traditional conservative values of “life and family” and is on record as opposing abortion. 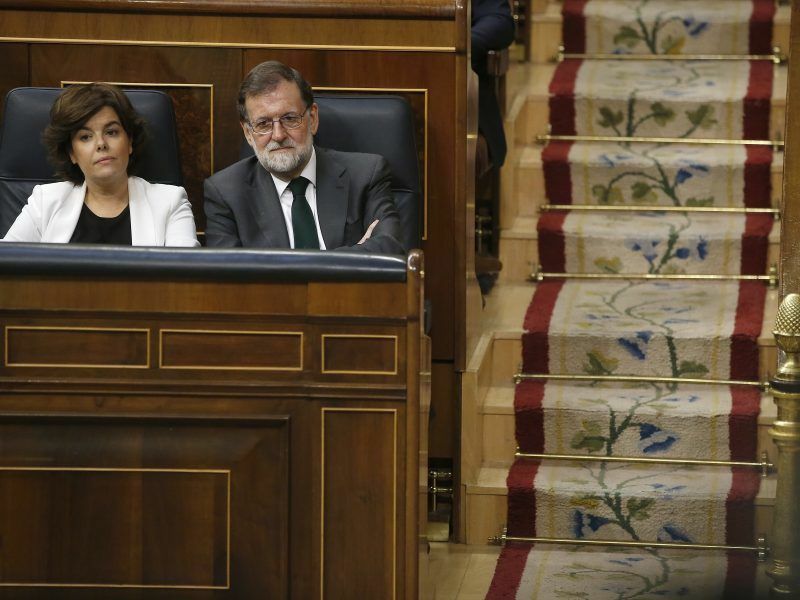 Rajoy’s departure brought the Socialists into office, and one of the first decisions Casado will face is the extent to which the PP should give parliamentary support to Prime Minister Pedro Sanchez’s minority government. In a message of congratulation on Twitter, Sanchez said he wished Casado – who will also be the PP’s next candidate for prime minister – “strength for the task ahead” and that the government would strive for economic growth and a reconstructed welfare state. Enhorabuena a @pablocasado_ por su elección al frente del @PPopular. Ánimo en la tarea que tiene por delante. El Gobierno seguirá trabajando por el crecimiento económico, el empleo digno, la conquista de nuevos derechos y libertades y la reconstrucción del Estado del Bienestar. Signalling likely tensions between the two parties over fiscal issues, Casado criticised plans by the Socialists to raise taxes, saying he would push for lower income and corporate taxes to increase competitiveness. The 2019 budget plan, which includes the largest rise in the spending ceiling since 2014 and increases in deficit targets, is expected to be submitted to parliament next week. The party has lost voter support in recent years, notably to new market-friendly party Ciudadanos and ran a minority government under Rajoy with 134 out of 350 parliamentary seats. But the Socialists hold just 84 seats, forcing it to agree pacts with smaller parties to win the no-confidence motion and raising doubts as to whether Sanchez can stay in office until the next scheduled national election in 2020.